Since the very beginning, Mountain Wilderness has struggled against the use of the Pointe Helbronner, in the Mont Blanc range, as a belvedere for wealthy tourists. One of the first actions undertaken by MW was the occupancy of the cable-car of the Glacier du Géant, in 1988. 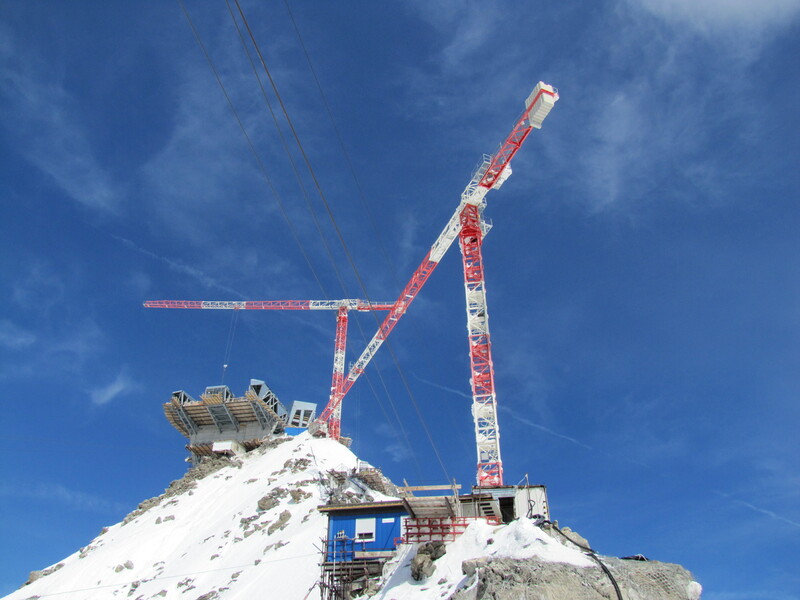 In 2011, new works began on the Pointe Helbronner, in order to build the world’s most expensive cable-car (a 110 millions Euros project), linking Entreves, in Italy, to the Pointe (in France), with the aim to get a four-fold increase of the number of tourist, to an annual figure of 300,000. MW has condemned this new attack against high altitude environment and the transformation of the range into a Luna-Park, notably attacking the project, in 2013, before the Italian justice. After a program presenting the project on the RAI Uno TV channel, a letter to the President of the RAI has been sent by environmental groups, among which Mountain Wilderness Italy, to protest against the unilateral presentation of the present works. We followed with incredulity the episode of January 10, 2015 of “The White Line”, telecast aired on Rai Uno, and in particular the broadcast on the construction of the new cable car intended to reach the summit of Entreves’ Pointe Helbronner (Aosta Valley), where a gigantic building is being built with belvedere restaurant, in total disregard of the cultural and environmental values of the Mont Blanc and more generally of the high mountains. It is well understood that those responsible for this attack will defend the macroscopic opportunities; less acceptable is that the public service will follow all the way passively these positions, without feeling the need to seek other opinions, thus respecting a complex, serious and neutral information. The company responsible for those violations would have the right to sing the praises of what is been done, but only by buying precise and explicit advertising space. It is not acceptable that such advertisements are imposed to users as information, as is clearly happening in “The white Line”. Our associations, which are fighting since years in all sorts of ways to keep intact the natural heritage of the country, are requesting that the RAI opens an open and clear debate on these hot topics. It will be up to the audience to decide which side is right. Confident in your attention and your equilibrated intervention, we send you our best regards.